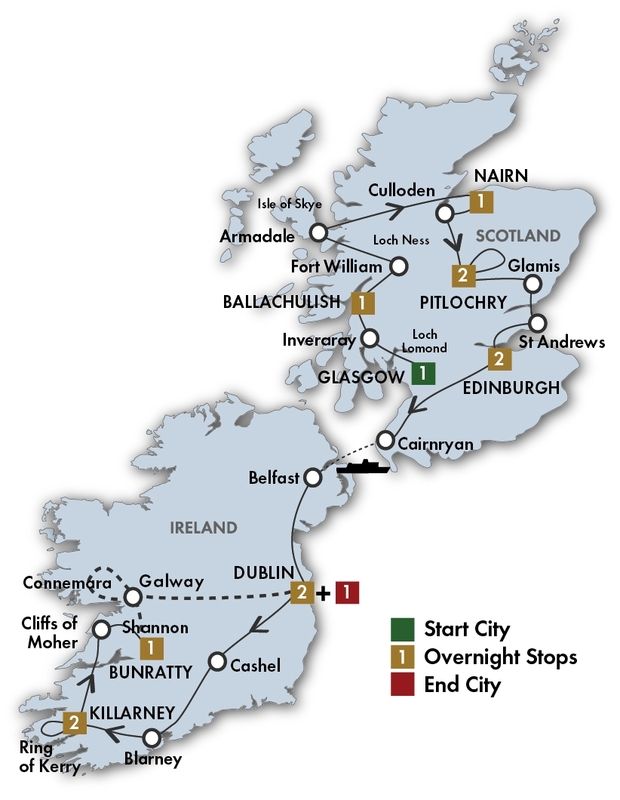 CIE Scottish & Irish Dream Tour - CIE Tours International tours. Lowest Prices! Reserved seats for the Royal Edinburgh Military Tattoo on July 28 to August 18 departures. Sample a "wee dram" as you learn about whisky making at Blair Athol Distillery. Blarney Castle Built nearly 600 years ago by one of Ireland’s greatest chieftains, Cormac MacCarthy,this stronghold has been attracting attention ever since. Millions have flocked to Blarneyto kiss the legendary Stone of Eloquence, found at the top of the tower, making it one ofIreland’s greatest treasures. Skellig Experience You can experience many aspects of those offshore Skellig islands while remaining on the dry land, in a custom built, stone clad, grass roofed, prize winning building located right on the waterfront beside the Valentia Island bridge at Valentia, County Kerry! 13 Breakfasts, 1 Lunch and 8 Dinners including a Scottish evening in Edinburgh, a medieval castle banquet, and Merry Ploughboy Pub dinner and show. Tour begins 2:30 PM at your Glasgow hotel. Your guide will lead you on an introductory tour of central Glasgow. See the main attractions including parks and squares and view extensive art collections at the Kelvingrove Art Gallery and Museum. Join your group for a welcome drink.